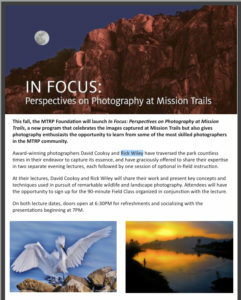 This fall, the MTRP Foundation will launch In Focus: Perspectives on Photography at Mission Trails, a new program that celebrates the images captured at Mission Trails but also gives photography enthusiasts the opportunity to learn from some of the most skilled photographers in the MTRP community. Award-winning photographers David Cooksy and Rick Wiley have traversed the park countless times in their endeavor to capture its essence, and have graciously offered to share their expertise in two separate evening lectures, each followed by one session of optional in-field instruction. At their lectures, David Cooksy and Rick Wiley will share their work and present key concepts and techniques used in pursuit of remarkable wildlife and landscape photography. Attendees will have the opportunity to sign up for the 90-minute Field Class organized in conjunction with the lecture. Rick will speak on Thursday Nov 1 from 7:00pm – 8:30pm with available field class on November 18 at 9:00 am. On both lecture dates, doors open at 6:30PM for refreshments and socializing with the presentations beginning at 7PM.